Has The Rally In Japan’s Nikkei 225 Run Out Of Steam? In the year that followed the stimulus program initiated by Prime Minister Shinzo Abe of Japan in December 2012, the Nikkei 225 equity index rallied nearly 57% by the end of 2013. That stimulus program, which triggered the torrid rally of 2013, incorporated the economic policies of Prime Minister Abe, known as Abenomics. It consisted of three key initiatives, which included fiscal stimulus, monetary easing and structural economic reforms. Nevertheless, by the end of 2013 the Nikkei 225 index could not rise above long-term trend line resistance at 16,320. Moreover, the Nikkei 225 also broke below steep upward sloping trend line support at 15,380, which suggests that a correction has likely begun. A mild shift away from risk assets coupled with a moderate run into safer assets has given the Japanese Yen a modest lift in recent weeks with Dollar/Yen strengthening from 105 at the beginning of 2014 to 102.50 on Friday. This strength, however, pales in comparison to the decline in Dollar/Yen that saw it retreat from 83 in December 2012 to 105 by the end of 2013. Nevertheless, recent Yen strength could become more pronounced if global political tensions continue to increase. Such a scenario would, in turn, make Japanese exports less competitive and could erode equity values in the process. Another economic issue that is lurking around the corner is the Japanese national sales tax, which is set to rise to 8% in April from 5% currently. While some observers expect to see the negative side effects of the sales tax hike to dissipate within 9-to-12 months afterwards, a near-term slump in consumer spending is nevertheless likely. For now, a sell-into-strength trading strategy regarding the Nikkei 225 is likely to prevail over the short-to-intermediate term. 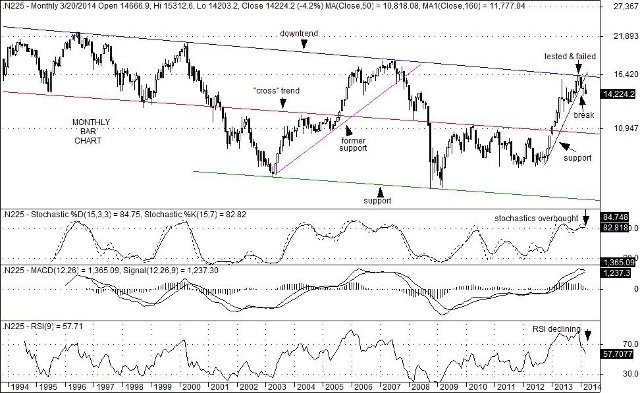 This entry was posted on Sunday, March 30th, 2014 at 11:50 pm	and is filed under Nikkei 225 Index (N225). You can follow any responses to this entry through the RSS 2.0 feed. You can leave a response, or trackback from your own site.